Click on the links to watch video clips and find out more about some of the many different types of drones. Watch footage shot by "Phantom 2" quadcopter drones flying over an active volcano. Find out about swarm robotics and see how robots working together can act as a search and rescue team. See a drone's-eye-view of dolphins, migrating gray whales and a newborn humpback whale and its mother. Watch a video about the "Hummingbird" drone and how it can be used. See how "Gimball", a crash-proof drone, could be used for search and rescue missions. Watch a video about a small throwable robot that can be used to search buildings. See how a four-legged drone keeps its balance and moves over rough terrain. Watch a robot overcome challenges on an obstacle course. Find out how drones help farmers. Watch a snake robot climb a tree and find out how it can move through tight spaces. See how an Autonomous Underwater Vehicle (AUV) can monitor conditions underwater and gather data. Watch a video about a "Global Hawk" UAV used for "ISR" - intelligence, surveillance and reconnaissance. Highlights of the "Reaper" UCAV, a drone also known as "Predator B". See how a "Predator" drone can assist troops on the ground. Watch "Taranis", a UK unmanned combat vehicle, carry out a test flight at an undisclosed location. Find out about "Puma", a solar-powered drone, and see how it can be launched by hand. Review five years of discovery on Mars by the Curiosity rover. Watch a report about how close-up pictures of Mars were first taken over fifty years ago and how Curiosity records its exploration of Mars today. Find out about a remote-controlled helicopter that may one day fly on Mars. What are drones? How do they fly? Could a drone space rover reveal the secrets of distant planets? How can a fire-rescue drone save lives? 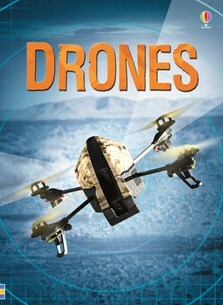 This fascinating introduction to drones has simple text, colourful illustrations and detailed photographs, with internet links to carefully selected websites with video clips and more information.